Silversmith and Glitter & Grit Studio owner Sarah Lightner is back with another of her popular beginner to advance silversmithing class. In addition to teaching basic silversmithing principles such as fabricating, soldering and silver milling, Sarah is adding a new dynamic–fold forming and torch fired enameling. Interested students should to come with a project in mind–a ring, pendant etc. Sarah will work with you on design and try to highlight finishing a little more. 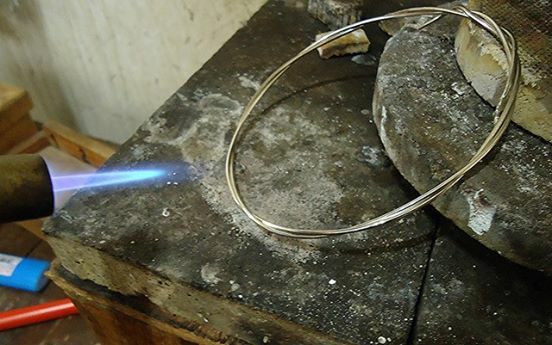 Then the last three sessions, of the eight week course, we will make a bracelet using fold form techniques and enameling. This eight-week course costs $275, plus the cost of silver. If you have silver to recycle, please let Sarah know in advance.